Roughly 1% of the U.S. adult population are Muslims. The political and social scrutiny focused on this small group has led to major political figures advocating discriminatory practices based on religion alone. 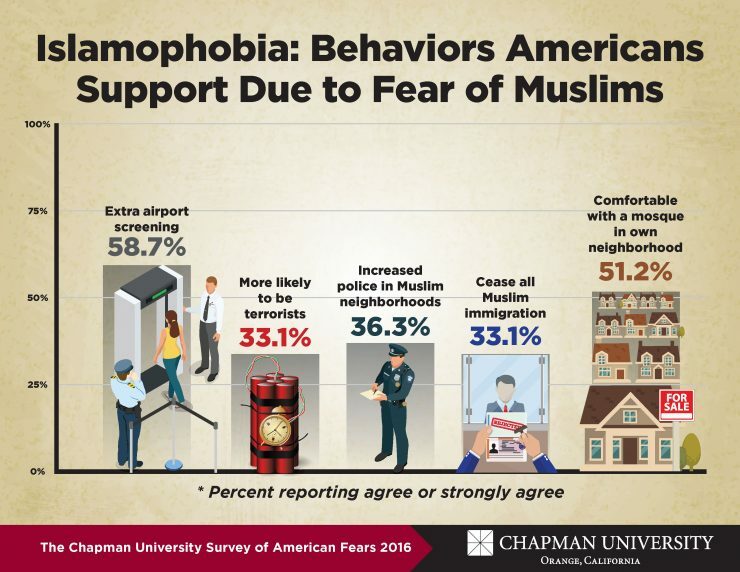 In Wave 3 of the Chapman University Survey of American Fears, we explored how Americans as a whole view Muslims. Our results show that a large proportion of the adult American population distrusts Muslims and believes extra security measures should be employed against them. To examine how Muslims are viewed relative to other segments of society, we asked about trust for six broad groups of Americans. 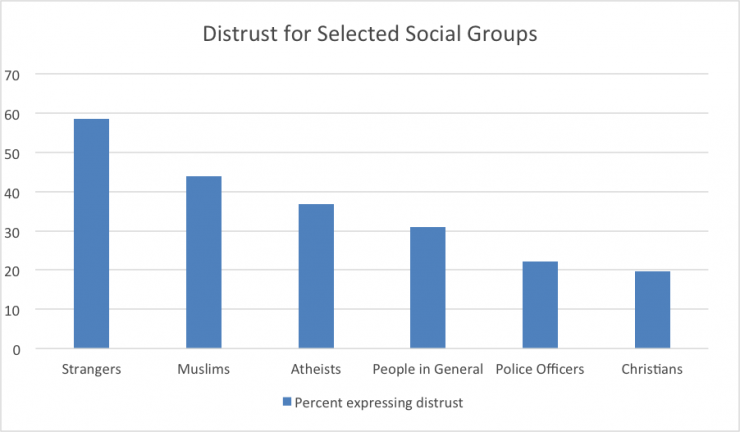 Only “strangers” were more distrusted than Muslims. 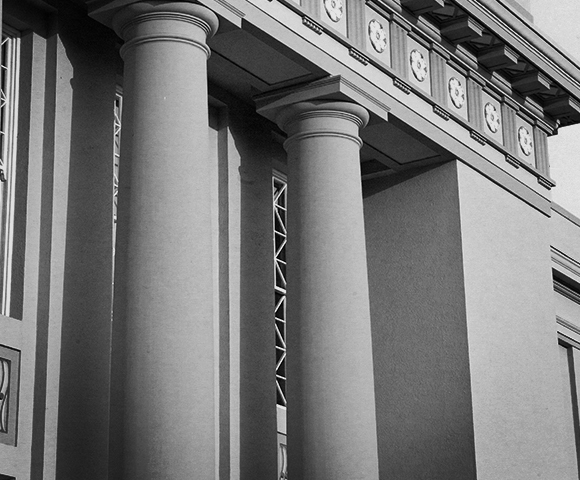 We included five questions that directly measured opinions regarding Muslims. Three questions focused on whether there should be increased social monitoring of Muslims compared to other groups. These asked whether Muslims should be subjected to increased screening at airports, if police presence should be increased in Muslim neighborhoods, and whether America should cease all immigration from Muslim countries. The other two questions focused on general attitudes toward Muslims, the first asking if Muslims are more likely than others to be terrorists and the second asking if respondents would be comfortable with a mosque being built in their neighborhood. Results for the whole sample are shown in the chart below. The results mirror our items on distrust of social groups. Nearly half of Americans, 48.8%, report that they would not be comfortable with a Mosque being built in their neighborhood. One third, 33.1%, report that Muslims are more likely to engage in terrorism. The same percentage agree or strongly agree that the U.S. should halt all immigration from Muslim nations. This climate of suspicion has led many Americans to believe that Muslims should receive extra attention from law enforcement, with a majority of Americans, 58.7%, agreeing that Muslims should receive extra security screening at airports (though it should be noted that 76.1% reported that they would be willing to submit to more screening themselves if it reduced terrorism). Roughly one-third of Americans agree that Muslim immigration should be halted (33.1%) and that Muslim neighborhoods should have an increased police presence (36.3%). For a nation that touts its commitment to religious liberty, the prevalence of these beliefs should be disturbing. Distrust of Muslims and support for religious discrimination is broadly distributed in American society but it is not distributed equally. We examined whether differences existed based on region of country, gender, race, age, education, and political party affiliation. All of these correlates were significantly associated with Islamophobia. Social scientists have often looked at regional differences by comparing the Northeast with the Midwest, South, and Western areas of the country. Examined this way, there were small but insignificant differences in beliefs about Muslims. What was striking, though, was the difference between people living in metropolitan areas and nonmetropolitan Americans. Urban residents are much less likely to distrust Muslims or support institutionalized discrimination. 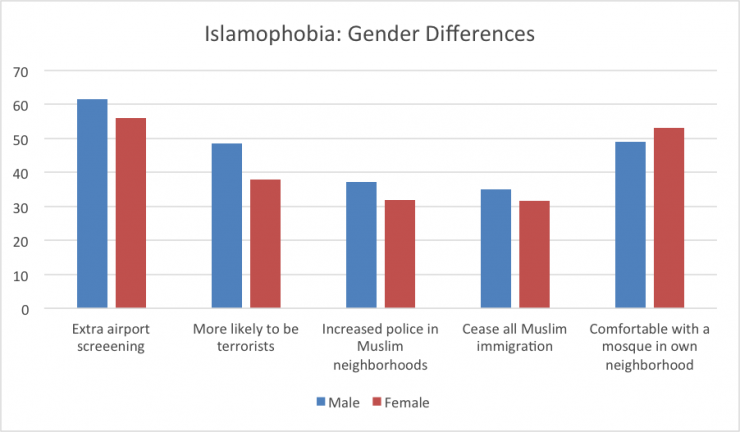 Men are more likely than women to hold anti-Muslim opinions. We compared non-Hispanic whites to the rest of the American population to see if there were racial differences in anti-Muslim sentiments. 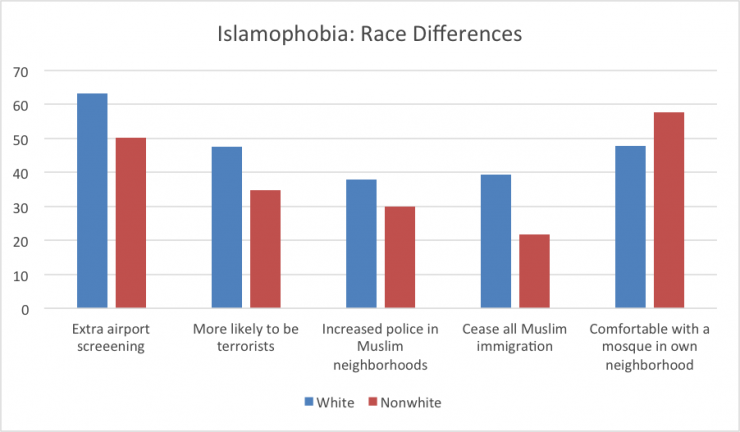 Whites show significantly higher levels of Islamophobia than non-whites. A further examination of the non-white group showed that African-Americans reported significantly lower anti-Muslim sentiment than other minorities. 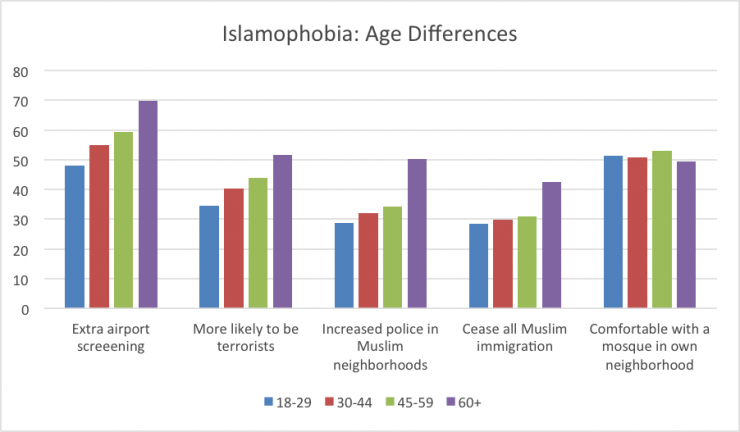 Younger adults are less likely to hold anti-Muslim views than older Americans. Although all age groups were split roughly in half on whether they would be comfortable with a mosque in their neighborhood, those over 60 were significantly more likely than all groups to express support for enhanced security measures against a religious group and to believe Muslims are more likely to be terrorists. Previous research has shown that higher levels of education are related to lower levels of prejudice toward minority groups. Our examination of American attitudes toward Muslims supports this conclusion. Those with a college degree or higher were less likely than any other group to support enhanced security measures against a religious group. They were also the only group where a majority reported they would be comfortable with a mosque being built in their neighborhood. The relationship is less clear at the lowest levels of education. Those with no high school degree were less likely to express anti-Muslim views than those with a high school degree but no college. However, they reported more anti-Muslim views than respondents who had some college or a college degree. 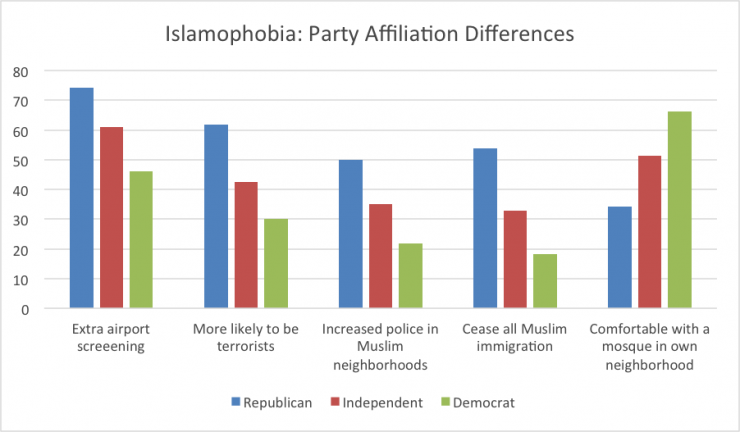 There is a strong relationship between political party affiliation and anti-Muslim views. Republicans expressed the highest levels, Democrats the lowest, and independents were in the middle. 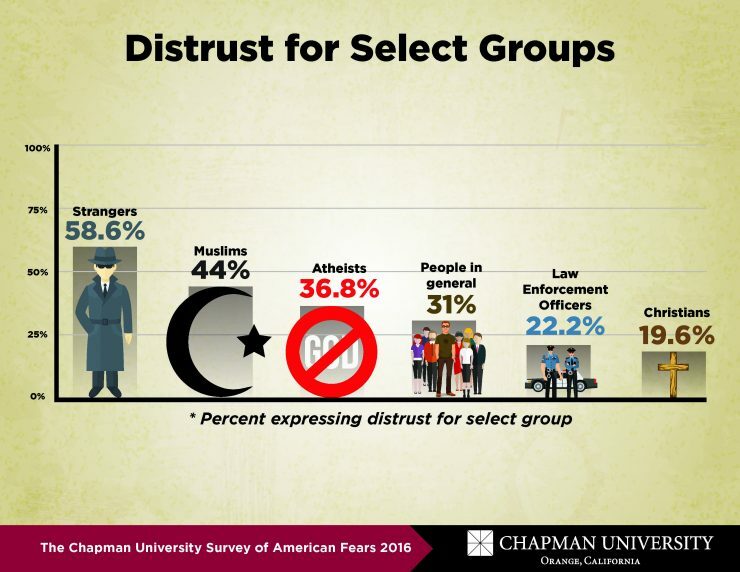 Results from the Chapman University Survey of American Fears show significant portions of the U.S. population distrust Muslims and believe the nation is justified in singling out one religious tradition for increased law enforcement scrutiny. Those with Islamophobic views are more likely to be rural, male, white, older, and lacking a college education. 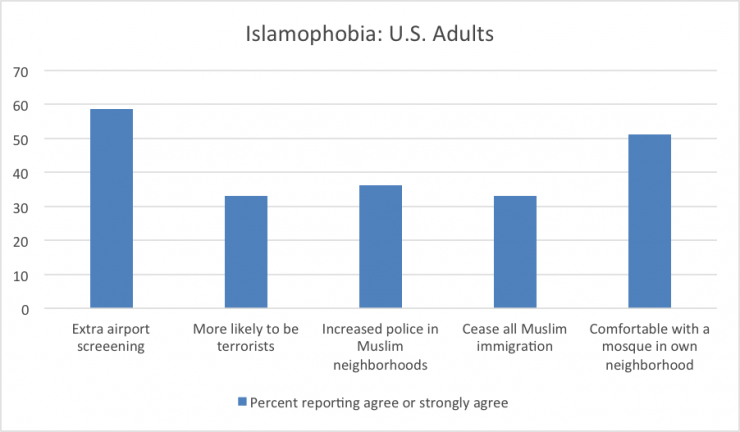 The survey data do not allow us to dig deeply into the sources of anti-Muslim prejudice. Some of the differences discussed above suggest that unfamiliarity with Muslims is a factor, especially the urban-rural comparison. The differences based on political party affiliation suggest that political rhetoric may be associated anti-Muslim prejudice though these data do not allow us to specifically test the causal order. Regardless of the sources, the prevalence of anti-Muslim sentiment is a concern. 7 people shared or liked this.